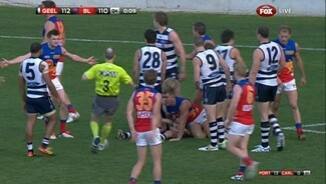 Cats InterchangeMark Blicavs off due to an injury. 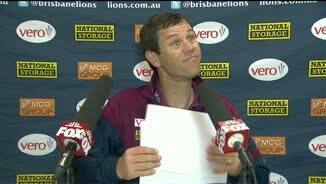 Lions InterchangePearce Hanley off due to an injury. Lions InterchangeDaniel Rich off due to an injury. Welcome to Simonds Stadium for the Geelong Cats v Brisbane Lions Round 23 clash. GEELONG has extinguished the Brisbane Lions' finals hopes, and secured second spot on the ladder, after a thrilling one-point win at Simonds Stadium on Saturday. The Lions needed to win to jump into eighth spot on the ladder and took it right up to the home team for the entire contest before Geelong held on grimly. The final score was 15.22 (112) to 17.9 (111). This was a match that literally went down to the final seconds. Late in the final term, key forward Jordan Lisle kicked a goal to reduce the margin to two points with three minutes to go, and the Lions' season was still alive. Joel Selwood then produced a classy banana goal before Lisle again stood up, taking a strong contested mark and converting to make the margin two points again. In a hectic final minute, Ryan Lester had a chance to win the game for the Lions, but his snap shot was rushed over the line with two seconds to go. Ash McGrath - who kicked an after-the-siren goal to beat the Cats in round 13 - booted six goals as the visitors threatened to cause a boilover. However, they fell agonisingly short. 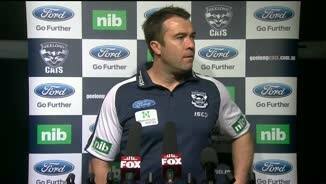 Cats coach Chris Scott watched his team's one point win with some detachment. "We're not too disappointed. We're certainly not ecstatic ... we'd like to play better," he said. “It would be fantastic to have played brilliantly, but we've had a pretty good couple of weeks prior to this, and as you can see with some of the teams' preparation going into this round, there are some teams in the comp that have bigger fish to fry." The only way the Lions could have remained in finals contention was if they had become just the second team in nearly six years to beat the Cats at their home ground. The visitors led by as much as 10 points during the third term, but Geelong was able to steady with the last three goals of the quarter - including two similar crowd-pleasing snaps from Travis Varcoe and Allen Christensen. The Cats extended that advantage to 26 points early in the final term, only for the visitors to come home much the stronger. 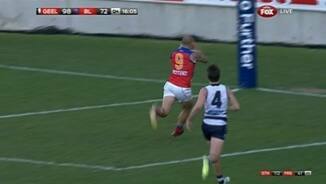 McGrath was the dominant forward on the ground, while Geelong shared the load, with 12 individual goalkickers. 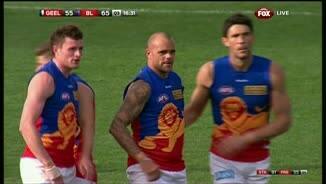 The Lions kicked the opening goal of the game through McGrath, the only member of Saturday's line-up who featured in any of their triple premierships teams early last decade. 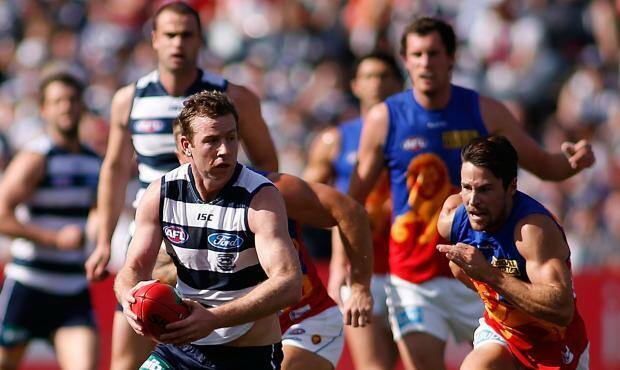 Geelong did not take long to steady, kicking four of the next six majors to lead by 14 at quarter-time. When James Kelly kicked the opening goal of the second quarter, it looked like the Cats were on the way to yet another routine victory at a ground where they had won 42 of their previous 43 matches dating back to early 2008. But the Lions regrouped to kick seven of the next seven goals - including five in succession - to take an improbable six-point lead into the long break. The momentum continued to swing throughout a thrilling second half. Caretaker coach Mark Harvey said the Lions felt empty and shallow and disappointed after the loss but he commended it for performing with such intensity, given the turmoil that surrounded the club since the unexpected sacking of Michael Voss as coach. "No-one gave us any hope – not that that matters – I just think you have seen a group of players fight so hard for an opportunity and sit back now and be puzzled about what could have been," Harvey said. Having come up just short on Saturday, the Lions will now turn their attention to finding a new coach to replace Voss, who took more than a passing interest in the game against the Cats.